Late Friday night, 24 August, Rigoberto Colina García, a 29-year-old worker at a lubricant company just outside the Amuay Refinery compound in Venezuela’s Falcon State, had sent this message on his Blackberry. (La República, 28Aug12) Some hours later, at 1:11 AM Saturday, a tremendous explosion killed over 40 people sleeping or working in buildings beyond the refinery’s perimeter, including Rigoberto and four of his co-workers. This is the worst disaster in Venezuela’s modern oil history, and one of the worst refinery accidents ever worldwide. This week, across Venezuela, President Chavez and PDVSA leadership have been targets of public criticism and outrage. Clearly, industrial and political policies of PDVSA and the Venezuelan state contributed to this disaster. Meanwhile, yesterday I found a somewhat tangential, but particularly unseemly fact. It seems that President Chavez’ only recent involvement with Amuay in the months preceding this disaster had nothing to do with improving the productivity of the facility, much less the safety of workers and neighboring citizens. No, rather, his involvement was a scheme to bolster PDVSA’s material support for the dictatorial regime of Syria’s Assad in suppressing the popular revolution there. This scheme apparently accounts for the origin of some of the naphtha that burned for four days following the explosion. But first, the facts of the disaster, in so far as they are known. When a refinery tank explodes, people beyond the facility perimeter should not die or suffer significant injury. Never. At Amuay, one worker died within the refinery’s area, which is an industrial tragedy. However, the remaining 40 to 47 of the dead should not have died no matter what sort of refinery explosion took place. The dead included about 20 members of a national guard engineering unit who were repairing the local airport. plus several of their family members staying with them at a nearby barracks. Note: This barracks was located outside the compound’s perimeter. The very fact that 40-47 people died outside the southeastern perimeter of the refinery complex, and beyond the road there, demonstrates that the buildings they died in were, ipso facto, built within the potential blast radius of high-vapor-pressure, liquefied-gas tanks inside the facility. This is not my technical expertise. However, I don’t understand how an experienced chemical engineer could not look at this site and say, rather quickly, “The community is too close to these tanks.” It is pretty basic chemical engineering–or physics–to be able to calculate, or look up, the magnitude of a travelling pressure wave as a function of radial distance from an exploding spherical LP (liquid-propane) or LNG (liquid natural gas) tank of approx. 15 meters diameter (topped off, that’s about 1,766 m^3 of liquid!). 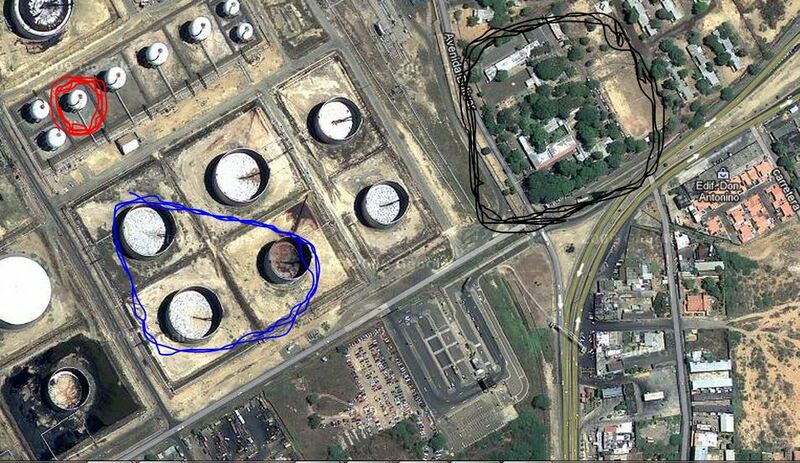 It is not clear if the present demarcation of the facility’s perimeter vis-a-vis these tanks was done by pre-revolutionary PDVSA’s Lagoven that operated the refinery after its 1976 nationalization, or by the foreign firm Creole, owned by Standard Oil (today Exxon) that originally built the facility around 1950. But, clearly, neither “revolutionary” PDVSA nor its predecessors ever rectified the situation. [Falcon Governor Stella] Lugo said 520 houses near the refinery had been affected by the disaster, and residents could be seen Tuesday removing belongings with the help of national guard troops. Besides the dead, over 80 people from this residential and commercial region, located to the southeast of the Amuay facility were injured. It seems to me that this points to a fundamental facility design problem. having said this, there remains the matter of responsibility for the blast itself. There were seemingly conflicting reports, first of all that a “propane” tank exploded, then statements by PDVSA president Ramirez and others’ saying that “naphtha” tanks were involved. These are not necessarily contradictory. At first, two of these caught fire, then later a third and they continued burning for a few days until their contents were exhausted. However, these fires began as the result of a separate explosion. Overview of the Amuay Refinery complex. The disaster zone is in the southeastern corner. Given reports of the smell of natural gas and other gasses for hours before the explosion (Note: One can’t actually smell natural gas; rather one smells additives and contaminants–such as the hydrogen sulfide that Rigoberto detected with his company’s instruments), and given early press reports on Saturday that a “propane” tank had exploded, it seems that one of the spherical tanks in Figure 1 was what exploded. I have market the one that seems to have exploded in red–I may be off by one tank. And, this explosion was the direct cause of all the deaths and property destruction that reached so far beyond the refinery perimeter, as well as causing fires in the adjacent cylindrical naphtha tanks. I don’t know if it was LP (liquid propane) or LNG (liquid natural gas), or another high-vapor-pressure liquid that leaked from one of these tanks and caused the catastrophic explosion. However, these spherical tanks are of the type that usually hold these substances and could indeed produce a tremendous explosion. Note that this particular spherical tank is the one farthest to the west in a roughly east-west line of such tanks. 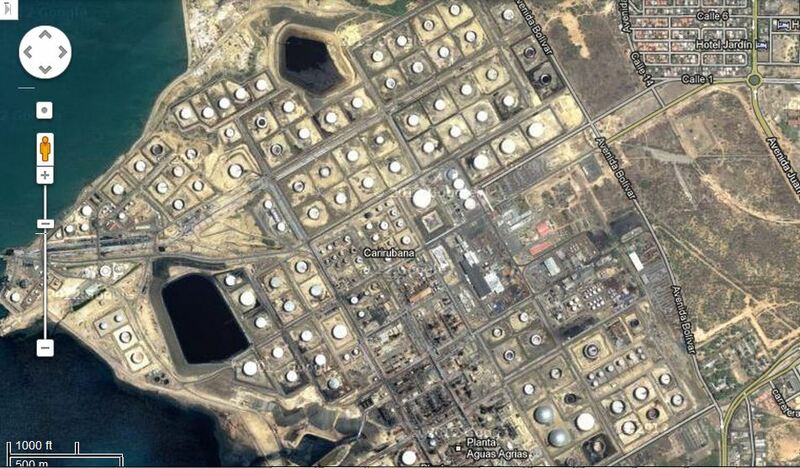 It is not the spherical tank farthest to the east which is the one closest to the periphery of the refinery; rather, it is the one farthest from the periphery. Had that nearest, eastern-most tank exploded, and not the western-most tank, the damage and the causalities in the community would in all probability have been significantly worse. It is not yet clear what particular type of leak or equipment failure caused the blast. There must be a credible investigation. However, people with direct knowledge of the facility report that the immediate cause may have been failure of a transfer line seal while filling or emptying a tank, or failure of a valve, etc. It seems to me that, if several workers were working on correcting a problem that had existed for some time, all would now be dead. The fact that “only” one worker died raises questions as to whether and how the leak was being attended. However, the obvious broader question was whether “deferred maintenance” and lack of investment by PDVSA were the ultimate cause, creating a disaster that was “just waiting to happen”? D. Did deferred maintenance and mismanagement at Amuay cause this disaster? There have been revealing reports written by knowledgeable Venezuelans, including retired PDVSA engineers, about the constant postponement and cancellations of scheduled shutdowns for regular maintenance at Amuay and other refineries over the past five or six years. In 2009 I spoke with local private contractors in Maracaibo who were deeply frustrated at cancellation of contracts for repairs and maintenance at this complex, and the situation has only worsened since. At that time, when I asked PDVSA and JV-partner personnel in Maracaibo and Caracas about refinery “efficiency”, a typical sarcastic-retort was “What efficiency?” And, when I asked people with access to President Chavez about refinery maintenance, I was told that there had been a recent decision to give more money to the refineries, and they assured me that “this problem is going to be addressed.” That was 2009. One of my questions at the time was: “Why is this something that is decided in Miraflores?” Discussion ensued about the need to leave sufficient profits in the hands of nationalized industries, whether under capitalist or socialist governments, or they will have no self determination to maintain their viability. Political-economic theories aside, suffice it to say, these refineries are nowadays a string of disasters waiting to happen. One cannot say any particular accident is due to a pattern of poor maintenance without a thorough investigation. After all, a meteor can indeed strike the best maintained refinery. However, one can say that this accident at Amuay is but one in a series of all-too frequent accidents at Venezuelan refineries over the past five years or so. And, this general trend, as far as industrial policy goes, is due to managerial incompetence and deferred maintenance. To be specific, this general failure is due to, first, the loss of skilled technical and managerial personnel in the ruinous 2002 strike; the unwillingness of the Bolivarian state, for sectarian political reasons, to trust the most capable universities to rapidly train new personnel after the 2002 strike and 2003 anti-Chavez coup-events; and due to the unsustainable over-diversion of PDVSA revenues to clientelist social programs designed to maintain the waning loyalty of President Chavez’ electoral base. A Venezuelan oil tanker is returning to Venezuela from Syria with a cargo of naphtha, shipping records showed on Thursday, after delivering badly needed diesel early this week as Western sanctions, causing severe shortages, hurt Syria’s economy. The tanker loaded a cargo of naphtha, a refined petroleum product that can be used to make petrol, from the Syrian port of Banias. Satellite tracking data shows the vessel is due to reach Amuay in Venezuela on June 12. So, a swap was taking place. The Negra Hippolita was returned to the Amuay refinery with naphtha from counter-revolutionary Syria. That is the great scheme H. Chavez had for the Amuay refinery these past several months. And now, for his efforts, he has been invited by Iran to help it bring about an end to that civil war in the mutual interests of this three-way cabal of politically bankrupt regimes. It is, of course, not possible to know what fraction of the naphtha in the three tanks that burned at Amuay after the explosion were imported as part of this latest petroleum diplomacy scheme of President Chavez, Looking back at my posting of 20Feb12 on PDVSA’s shipments to Syria, I see the Negra Hipolita can carry 47,000 tonnes of diesel. There are roughly 7.33 barrels of diesel per tonne of weight, so that’s about 340,000 barrels. Hence, the ship could have delivered up to 340,000 barrels of Syrian naphtha. In any case, one thing is clear: the whole unseemly diesel-for-naphtha affair has ended in flames, as part of a great tragedy. Chavez, 58, toured the scene dressed in mourner’s black and hugged weeping family members. … (and) dismissed charges of neglect at the country’s premier refinery and urged Venezuelans to “move on” after the tragedy. This entry was posted in Chavez, PDVSA, Uncategorized. Bookmark the permalink. Good commentary. The biggest accidents in refineries tend to occur in production units (the isomerization unit at the BP Texas plant or a crude distillation tower in the Bay area just recently), And they tend to occur while work crews are active in the area/unit – maintenace/repair being a big one. As you point out, the first casualties were mostly national guardsman at the nearby barracks and not workers. . Initial blasts were early in the morning on a saturday. It seems there was no maintenance or routine work being performed. And this was a storage unit at the edge of the refinery complex, where intermediate fluids are kept while waiting further refining or use in other processes. In other words not the most active area. . While everything in a refinery is dangerous, from a risk-management standpoint, a storage depot area is not as dangerous as a processing unit where crude is being broken down. But, that might be the problem. It is easier to be complacent about the storage area. When allocating scarce resources it is the area where key safety measures and routine maintenance would not be given priority over other units. Simple neglect and spotty management could transform this into a ticking time bomb. Gracias, Tom, por este artículo. Es lo mejor que he leído desde la tragedia en Amuay. Seguimos ávidamente tu blog. ¡Saludos desde Caracas!